Lounge area in the largest cottage. 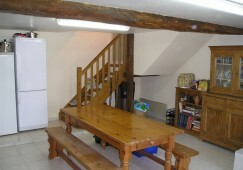 Spacious Family home with 3 holiday lettings. Delightfully modernised traditional Longère offering a superb 4/5 bedroomed home and 3 holiday lets with FOUR-STAR ratings. All standing in around 2 acres with swimming pool, productive garden, river frontage and playing field, situated in a tranquil village only 5kms from two busy market towns and about an hour from airports and the coast. The existing owners engaged a local architect to design top quality barn-conversions within the existing structure of the barn and stables forming part of the Longère. Using local tradesmen these conversions took place in 2004/5 and the business opened in 2005 with its own website & domain name. Since then it has gained FOUR-STAR ratings from all of the grading agencies and annual turnover has risen to in excess of €35,000. The House, Originally built as a farm, it was first modernised in the 1980’s so it has modern windows, plumbing, electrics and wall insulation. The current owners have replaced the kitchen and the bathrooms and had the electrics updated. At the front of the house is a large veranda with full-width sliding glass doors leading onto the owner’s patio. The ground floor is currently arranged with huge lounge; an open-plan kitchen/dining room with fully-fitted Siemens appliances; a family bathroom; WC and a double guest bedroom. Behind this part of the house there is a 36sq metre utility room and a cold store on the ground floor and two large double bedrooms on the first floor. On the first floor of the main house there is a large office leading into the master bedroom suite with 20 sq. metre bedroom; huge shower room with WC; storeroom and finally the unimproved Grenier. The Gites : The three gites have been graded 4-STAR by the tourist authorities, and were converted from the original Barns and Stables to provide two two-bedroomed and one three-bedroomed cottage accommodating in all up to 16 people. They are fully-equipped with all modern furniture, appliances and bathrooms. Each has a private terrace, and they share the 11x5m pool and games hangar. The owners went to a great deal of effort in selecting the location for the business. It had to be quiet, near to good walking and cycling country, not far from supermarkets and restaurants and close enough to tourist attractions to make interesting days out, with transport links to make getting there easy. Superb 4 bedroom house with a separate office, two bathrooms and light spacious family accommodation. 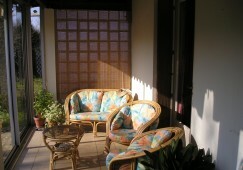 Quiet cul-de-sac village location, just 5 kms from two busy market towns. Within easy reach of local tourist attractions, beaches and airports. The family house at one end, the gites at the other. It is over 60 metres long! Standing in around two acres of grounds, with a river frontage and two road entrances. Planning consent: Permis de construire for developing the grenier. Lots of cheap competition in France, but we sold over 48 weeks during 2012, 60 in 2013, and over 70 for 2014 with confirmed bookings for 2015! As the French government tightens control of property letting they have stated that they will close down the poor quality gites. France wants to go up-market, we have proved it works. We are one of the first 4-STAR properties in Deux Sevres! Employees: None, just contract cleaners for the gites. Support & training: Handover training will be available as necessary. Home based: This business can be run from home.